Inspired after viewing the floral paintings of Georgia OKeefe, Carol Henry worked well over a decade to develop a unique photographic technique that would allow her to explore the internal spirit and essence of flowers. As a child, she says her fascination with organic design was mesmerizing. It was this passion that fueled her continued exploration while pursuing studies towards her Bachelor of Fine Arts degree. Confined in the college darkroom one afternoon, due to a howling blizzard, she discovered a way to reproduce the warmth and beauty of her subject by projecting light through the cells of the flower directly onto archival Cibachrome paper. What appeared was complete purity, without distortion or grain; just the simple radiant delicacy of the flower itself. Without using either camera or film Henry had developed a truly extraordinary technique that would shape the rest of her three decade photographic career. After the Cibachrome paper required for her darkroom process was discontinued by Ilford in 2012, Henry was unable to continue with the creation of this remarkable floral series. Because no negative is involved in her photographic process and the flowers can withstand only a single exposure, each 20x24 image is one-of-a-kind. All those who own a Carol Henry print appreciate that they retain the only image of a plant that once grew and flowers that blossomed. 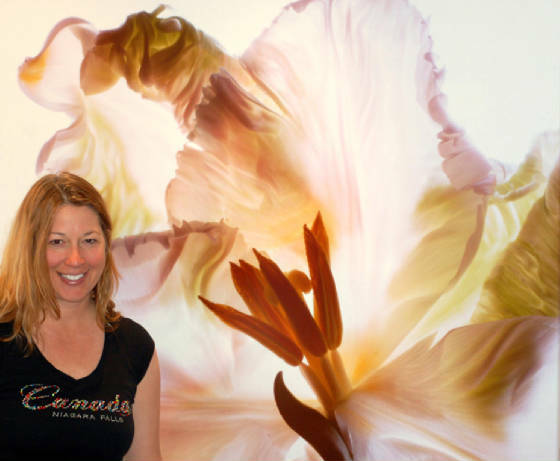 "Working with a photographic process of her very own, Carol Henry transforms the ephemeral splendor of live flowers into the permanent beauty of her photographic compositions. In the great tradition of silver mirror daguerreotypes, each of Carol's photographs is a unique visual, printed using the most luminous and stable color material of the Pre-Digital Photography Era." Dusan Stulik - Getty Conservation Institute.